Touch screen operation is the most outstanding feature comparing other brand of cloud frame, you can image what a frustration is when you operating cloud frame such a complicated device. Multifunction is another outstanding feature that distinguish Sungale's cloud frame from other brand. Cloud Frame covers all features of Wi-Fi wireless DPF. Based on wireless DPF, we have added cloud album and cloud storage. With cloud features, users can send photos to the frame from anywhere in the world by using their computer, tablet, smart phone. We provide free cloud storage to users. Cloud Frame allows family members to setup his/her albums/folders remotely, and send photos to his/her folders, then the albums will appear on the screen. 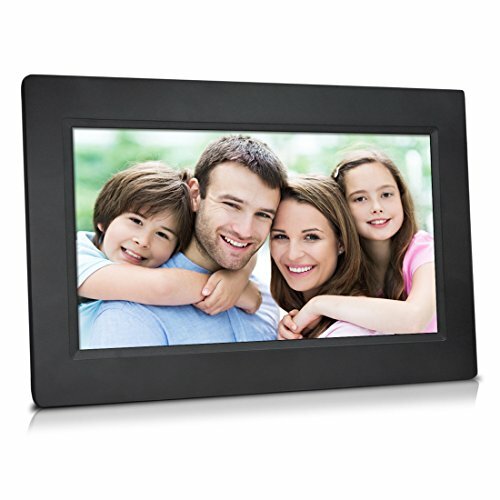 Supposing the user is a grandma who cares of all the family members who live in different states and cities, then all the family members can share their daily photos to Grandma's frame, and the frame will display these photo instantly. We call our Cloud Frame as Grandma Frame. This easy-to-use CPF1032 device features Wi-Fi connectivity and free cloud storage. It receives and displays real-time photos sent to it from anywhere in the world. The Cloud Frame allows users access their favorite social media sites such as Facebook, Twitter and Google+. From backup lists, you can find and install most popular photo hubs and video hubs such as Flickr, Picasa, Instagram, Netflix, Huluplus... You can select and watch endless movies at Netflix and other video-hubs. Touch screen operation is an outstanding feature comparing with other hot-marketing cloud frame products that are with RC to do the operation. More features: 1024x600 High-definition 10" LED display, 8GB internal flash memory, SD card slot, USB OTG, Dual interface optional, tabletop stand and wall mountable.